May 13 - Accident on US Hwy 287 MM 22, Cameron; Fire Call at Broadwater Ave. and Madison St., Harrison; Animal Complaint at US Hwy 287 and Airport Rd., Ennis; Medical Aid in 2500 Blk MT Hwy 41 S., Twin Bridges; Animal Complaint on MT Hwy 359 MM 15, Harrison. ENNIS - According to the National Weather Service (NWS), we aren’t completely safe from flood threats yet, but hopefully we don’t have too much longer to wait before local rivers start to recede. While the Madison River remains high, it currently faces little risk of flooding. ENNIS - The Madisonian is happy to introduce its newest staff member, reporter Reagan Colyer. 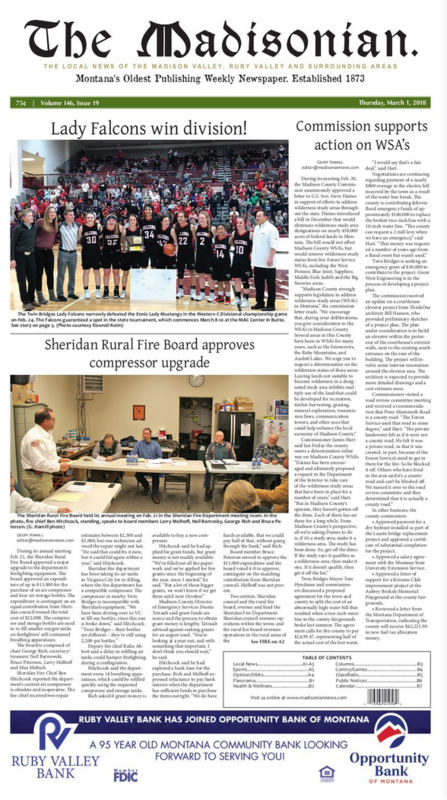 Colyer joined the editorial team on May 21, after community reporter Caitlin Avey transitioned to a new position in Helena. TWIN BRIDGES – Howard Chrest and Mark Savinski, both of Sheridan, were happy to share what both see as permanent links for future generations to the great outdoors – two recently acquired permanent access points to the Ruby River, and a third access in the works – Sunday morning, June 3. Above: Left to right are Lee Sargent and O.J. Palmer, Commanders of American Legion Post 65 and VFW Post 1723, of Ennis. These organizations placed American Flags on the graves of American Veterans buried in the Ennis Cemetery in preparation for Memorial Day ceremonies. ENNIS - Will Gilmore has earned some time off. He just graduated from Ennis High School, the class president and co-valedictorian with a 4.0 GPA, Honor Society member, having filled his extracurricular hours with athletics and community service. ENNIS – At a special meeting of the Ennis school board on May 24, the board approved moving forward with a $270,000 bid to expand the current weight room and add storage space at the high school, a project that would expand the building by 1,975 square feet. MADISON COUNTY - Anderson-Simpson Post 89 of The American Legion will conduct Memorial Day Veteran’s Remembrance Ceremonies at the Sheridan, Laurin, Taylor (Alder), Nevada City and Virginia City cemeteries on Memorial Day, May 28.